I had the pleasure recently of visiting Mitchell Denker, the son of GM Arnold Denker. I wanted to see if there were more items of interest that he had maintained at his home in North Carolina. 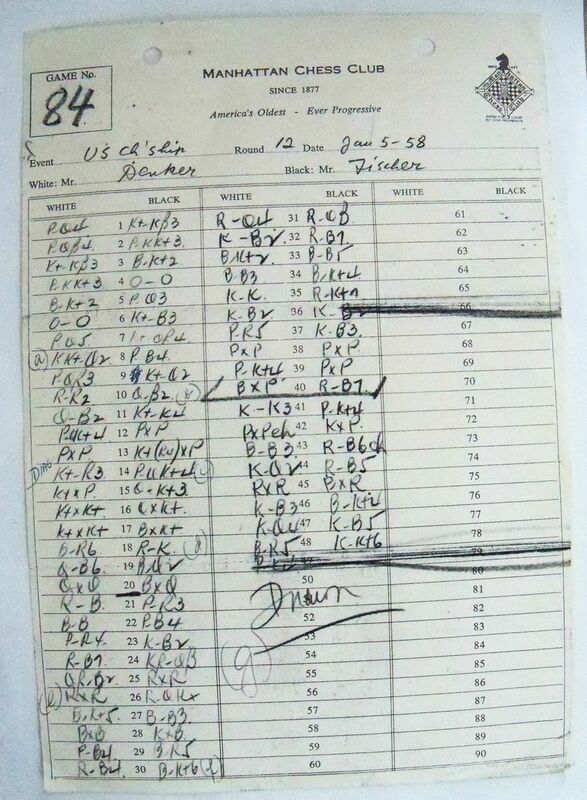 As we talked and reviewed the memorabilia of his father’s past, I came across a scoresheet dated January 5, 1958. Glancing at the top I noted the item was from the Manhattan Chess Club and I saw below: White: Mr. Denker Black: Mr. Fischer. It was hard to believe, but I believe I was holding the actual scoresheet used by Arnold in his game against Bobby Fischer that ended in a draw. Arnold played Bobby only two times with one win for Bobby and a draw in the other game. Although this game has been published many times, holding a piece of history is greatly appreciated by this retired history teacher. Below you will see what I saw.